Are you looking for network that offers 3 gadgets in just 1 postpaid plan? 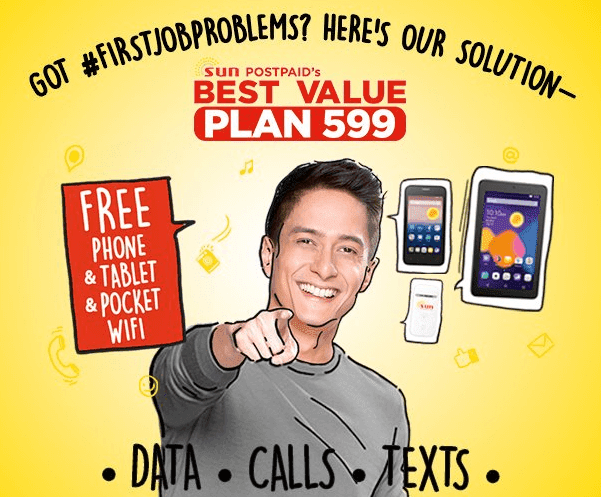 Here’s the answer to that question as Sun Cellular now offers free Android phone, tablet plus a pocket WiFi for only 599 pesos a monthly. Sounds interesting right? Be ready and prepare the requirements needed to apply Sun Postpaid Plan then visit your nearest Sun Shop to inquire for availability of these devices. Check out below what are included services and gadgets under this plan. This plan is available in 18, 24, and 30 months lock-in period. You can also apply through online, just visit Sun Cellular website and fill up the form required. This plan offer may change without notice, please visit your nearest Sun Shop to inquire for availability and pricing.